The landscape of Rock N’ Roll is littered with bands that were virtually ignored during their tenure but became massively influential to other artists. That was definitely the case with Big Star, the Choir, the Move and Emitt Rhodes. That’s also the story of The Quick. The nucleus of The Quick, guitarist Steven Hufsteter and drummer Danny Benair began making music together as teens. Their ranks quickly grew to include bassist Ian Ainsworth, vocalist Danny Wilde and Billy Bizeau on keys. In 1975, a chance encounter with record industry manager/Svengali/gadfly Kim Fowley secured real representation for the band. Kim Fowley had been a fixture on the Hollywood scene since the late ‘50s. At various times he was a songwriter, song-plugger, record promoter, solo artist, music producer and manager. Elegantly decadent, he was a caustic misanthrope and a world class misogynist. He is probably best known as manager for the Runaways, the all-girl Pop/Punk five-piece that were spawned in Los Angeles and worshipped overseas. Kim got The Quick a deal at Mercury Records, bought Billy Bizeau an actual keyboard and got the band in to record at Brother studios, owned by the Beach Boys. He also managed to convince Earle Mankey to produce. Earle had been in Halfnelson, which evolved into L.A.’s premier Art Rock band, Sparks, who would achieve a modicum of commercial success in the early ‘80s. 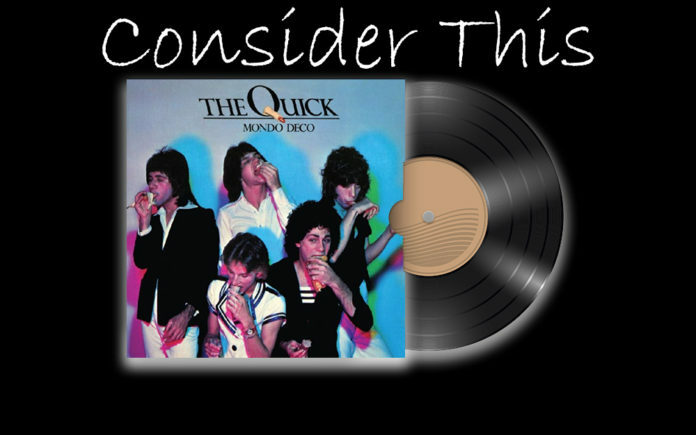 The Quick’s debut, Mondo Deco was recorded in under three weeks, but the five-piece butted heads with Kim Fowley who wanted the band to incorporate more “boogie” into their sound, (whatever that means). The guys held fast to their vision, pioneering a style that Fused elements of British Invasion and Glitter/Glam, plus a snotty attitude that presaged Punk Rock by a couple of years. Although the album was released in 1976, Kim lost interest and consequently, Mercury Records did too. Although the band acquired a rabid fan following, the record kind of slipped through the cracks. The Quick continued to play shows around the southland, including an opening gig for the Metal/Pop band, Starz at the Santa Monica Civic. (Metalheads in the audience pelted them with garbage). Local tastemaker Rodney Bingenheimer constantly championed the band on his influential KROQ radio show. So did Fan Club President Lisa Fancher (who went on to start the iconic indie label, Frontier Records In 1980), as well as actor Mark Hammill, who became better known from the “Star Wars” saga as “Luke Skywalker.” Although The Quick ended their association with Fowley and Mercury Records, they continued to write and record. David Campbell (better known these days as Beck’s dad), produced some demos at Elektra Records, but the label passed. Still, they opened for the Ramones and the Damned. They also self-released In Tune With Our Times, a 10 inch EP. Sadly, they called it quits in 1978. Following the dissolution of the Quick, the guys all found a measure of success in the music business. Steven Hufsteter and Danny Benair formed the Falcons before Steven went on to the Cruzados, which later became Tito & Taratula. Danny ended up pounding his kit in the Three O’Clock before going behind the scenes, running two music publishing companies. Billy Bizeau wrote songs for the Runaways and Ringling Sisters before retreating from public view. Now Real Gone Music has partnered with Mercury Records to right some cosmic wrongs and release Mondo Deco on CD for the very first time. Although it’s been more that 40 years since The Quick came apart at the seams the music presented here still feels fresh, bratty and complex. The record gets off to an audacious start with a deconstructed/reconstructed take on the iconic Beatles cut, “It Won’t Be Long.” Twinkly toy piano notes tumble out of the speakers connecting with rippling guitar and Danny Wilde’s impossibly high vocals. There’s a Mozart-ian flavor to Steven’s guitar pyrotechnics anchored by Danny Benair’s anvil chorus drum attack. “Anybody” finds The Quick at their Punkiest. Muscular guitar riffs stutter and strafe over razor sharp bass and a brutal beat. Spartan lyrics sketch out a teen-rebellion construct. The guitar on the break pivots between fuzzy and angular. Meanwhile, the band manages to dismantle the Doo-Wop-y grandeur of Frankie Valli & The Four Seasons’ “Rag Doll,” stripping the track down to a Galloping gait, rumbling bass and swirly, backwards guitar. The guys’ tight harmonies nearly mask their lascivious intent. Finally, “Hi-Lo” blends quivery guitar, ornate harpsichord keys and ascending piano notes. Oblique lyrics hint at some post-coital dissatisfaction; “Overloaded, all rundown, thanks for the ride, now I’ll subside.” Whooshy backing vocals and flange-y guitar underscore the sexual ennui. The shoulda-been hits include “Hillary,” which features an insanely catchy guitar intro, boomerang bass and fluttery keys. The ambitious melody lands somewhere between the pomp and circumstance of a proper Rock Opera and the tongue and cheek debauchery of “The Rocky Horror Picture Show.” With just a few neatly turned phrases, pithy lyrics hint at both sado-masochism and a Madonna/Whore complex; “If I’ve been bad, and yes I have I know just what I need, call the girl who knows the World, who’s touch is bitter sweet/Introduced herself this evening, said ‘it’s clear to see that you’ll do fine, I know your Kind, now please submit to me.” Yikes, did anyone establish a safe word? Originally, Mondo Deco closed with “Don’t You Want It,” a sharp treatise on consumptive consumerism powered by darting keys, prickly guitar, brisk bass, a whip-crack rhythm and honeyed harmonies. But the CD adds the original Mercury demos and three heretofore unreleased songs. There’s the calibrated cacophony of “Teacher’s Pet,” which connects the dots from the maximum R&B of The Who to Prog-y flavor of The Nice. Then there’s the cinematic sweep of “Heaven On Earth” and lastly, a credible yet anarchic cover of “Born Free.” The saccharine soundtrack hit that won an Academy Award is wed to a surprising Bolero rhythm and tops out at 55 seconds. Despite the fact that The Quick were virtually ignored during their original run, these scruffy San Fernando kids wound up influencing bands like the Dickies, Redd Kross and Material Issue, just to name a few. Sure, they’ve mostly moved on to bigger and better things. But this is where it all started. This is how it began.